Oh, holy cow. . .the last few weeks have been a barrel of crazy sauce. Both my grandmother and step-father have been in the hospital, Easter and Spring Break happened, we sold the other house, my car just about died, I got a new car, and then there was the rest of the chaos that is everyday life. I'll leave the excuses at that and get on with this post. Because I'm so very far behind, I'm going to combine two posts in one and share both my March goal review and a little of what's new at the antique booth. First up is my display at Southern Antiques and Accents. Because of the above reasons, I unfortunately haven't been out there much. I popped in there the other day to add a few items and move a few others around the booth. 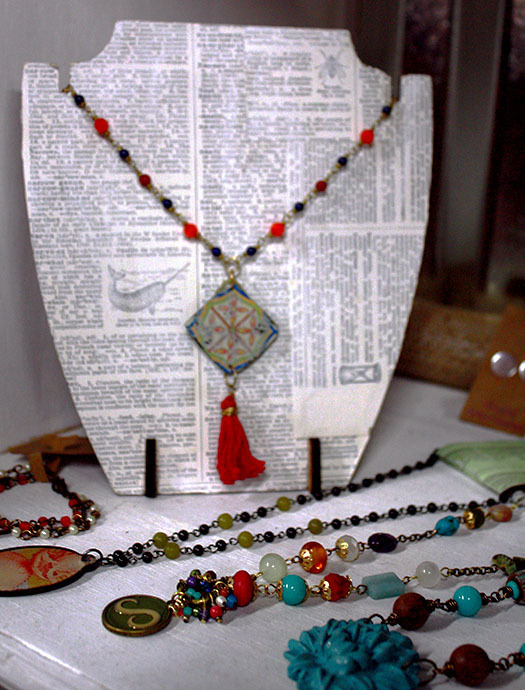 The Tin Fringe Necklace is new and fits right in with some of the other colorful pieces near it. 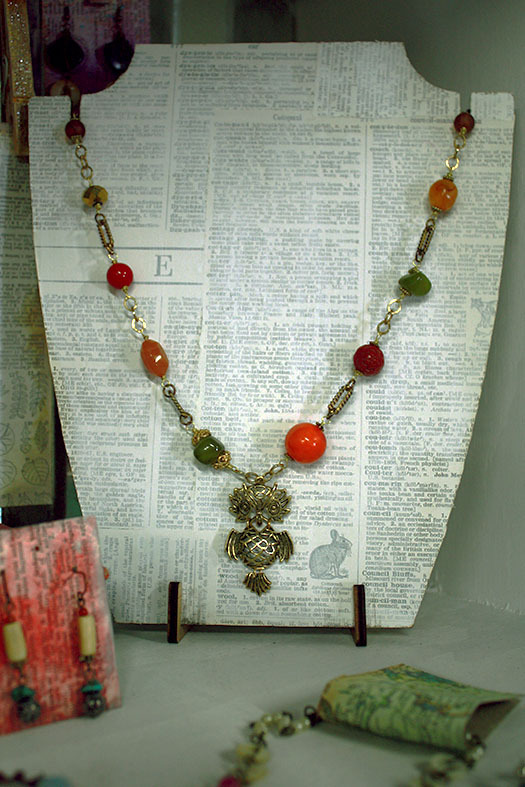 While this Kitschy Owl necklace totally screams Autumn to me, I just had to put it in the booth. I love the 70s vibe it gives off. This face necklace is so serene. There are also new earrings and bracelets out there too. At some point I'll remember to photograph those as well. However, you could head over to Southern Antiques and Accents in Fairhope and check them out in person if you really wanna! Now, for my March Goals! As I did for the February goals, let me remind you that each week I wanted to complete a Goal, a piece of Jewelry, an altered Card, at least one Blog post, and a Journal page. Because of the aforementioned crazy sauce, this month hasn't been very productive. However, I want to share the ups and the downs. I'm covering weeks 9-12 this month. My goal for this week was to create a new header for the CraftyHope Etsy shop. It wasn't too hard to do and I had this done in less than a few hours. However, within a few days of getting it up, I noticed that Etsy was alterting me to the fact that my shop was going to have a new look at the beginning of April. Well. . . shoot! I had to make another one to fit the new specs. Here's what I made. I'm pretty happy with it. I decided to use the whitewashed dictionary paper as a background since that's a signature of mine anyway. As well, I used most of the jewelry images I had used in the first rendition since those are some favorites. What do you think? You can see it in action in the shop. This task was completed a bit late. 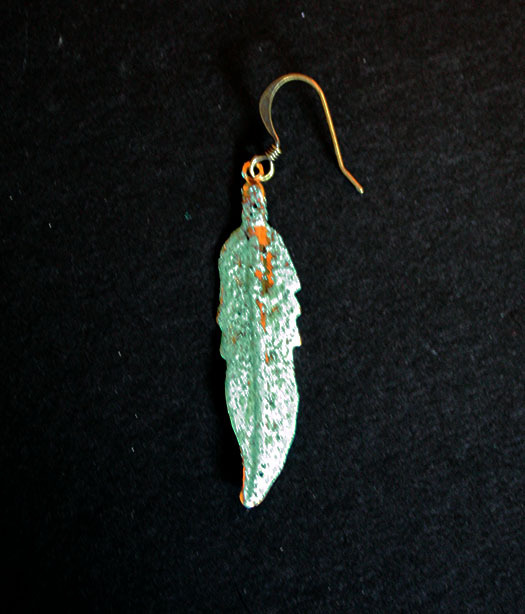 Since I was running behind, I went with something fairly easy and grabbed some brass feather charms. I aged them with Novacan Black before adding Iced Enamels and a sealer. And then. . . I wore them one day. Like the majority of my jewelry, I took them off in the living room in the evening and placed them on a table. During Spring Break, there was plenty of activity going on around and on that table. In the process, one of those earrings is now lost. Figures. But, you get to see the one above as proof that at least one was made that week. Isn't that enough? This was also completed a little late. I simply dripped alcohol inks onto the gessoed card and let them dry. From there, I glued on random paper shapes and a word sticker. The papers and sticker were outlined and the edge of the card was accented with a stamp pad. Done! As you may have noticed, I got only one blog post written for this particular week. In fact, it was my Goal Review for February. But, one blog post was enough to meet my expectations of myself. This page was started during the goal week, but finished a few days later. 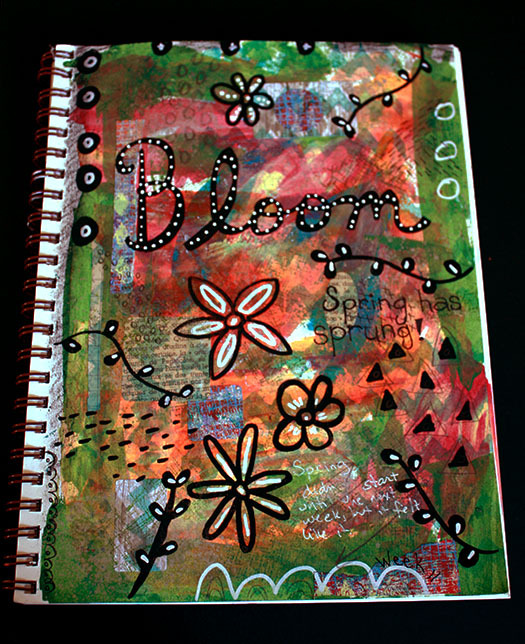 I had made some gelli plate stickers and a few come unstuck in the process, so I threw them on this page. Then, gelli prints were added before I colored the area with some watercolor crayons (and water) and acrylic paint. A basic black permanent market was used to write the words and draw the heart. 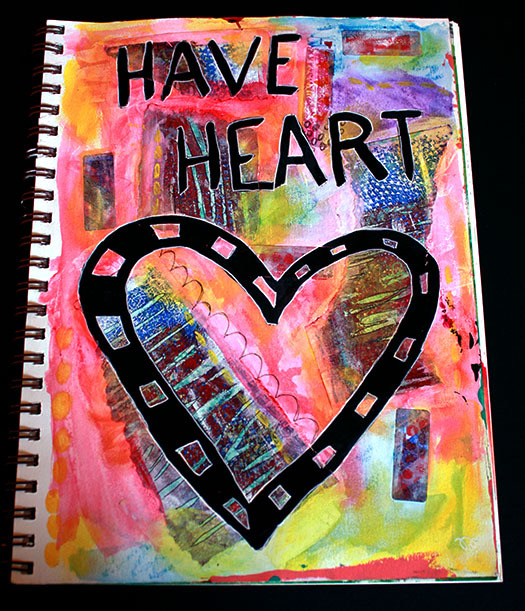 A white pen was used to outline the black words and heart. Done. For this week, I had hoped to finally get the sunroom painted. However, because my grandmother was not well, this didn't happen. After sorting through my jars of carded buttons, I discovered several cards that contained only one button. This felt like a waste of the buttons and my space so I pulled those buttons with the idea of creating a long necklace. This is where I am with it. I ran out of some of the large antiqued brass jump rings I was using in the project. I bought some that are the right diameter, but the gauge of the wire is just too thick. I've got more shopping to do. For now I'm at a standstill with this one. But, I got something started at least. Again, this card was completed late. I smeared on the black acrylic paint while working on something else. From there, I stamped onto the black with gold, blue, and white ink. Some red ink was drizzled down the card also. The LOVE is from a magazine clipping, and the heart was cut from paper I had sitting around. With a white Sharpie paint pen, I added the dots on the corners. The only post I was able to complete during this week was my Friday Finds post sharing the items I had received as gifts from a friend. 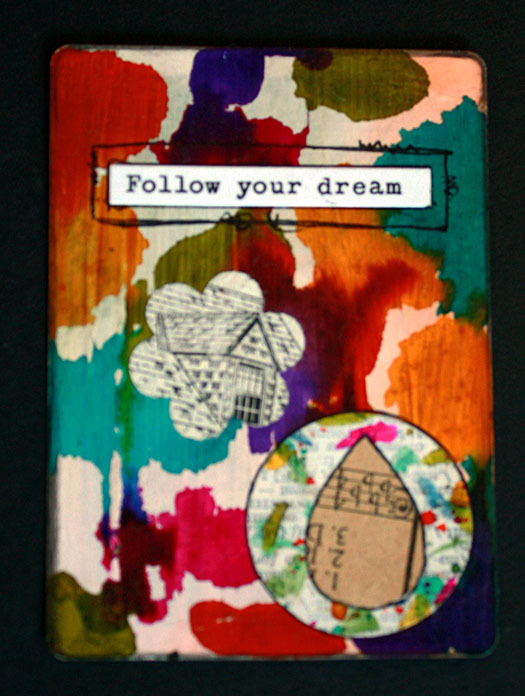 This started with a gelli print that I glued into the journal, I slapped on some acrylic paint in the empty spaces that matched the paint on the print. 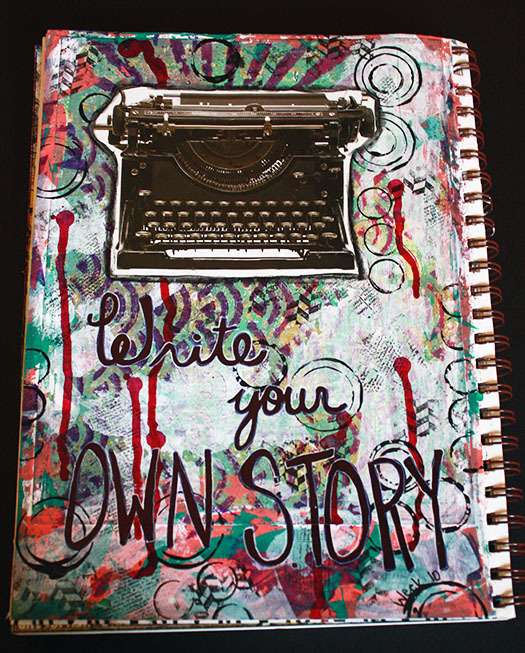 A little gesso, some stamps, and black rings were added around the page along with a purple-ish ink. I found the typewriter picture in my stash of magazine clippings, and the words just came to me from there. The image is highlighted with a stabilo all pencil. The words were written with a permanent marker and highlighted with a white pen. Since I knew I would be spending much of the week with my grandmother agin, I decided to make the goal a little more attainable. I hoped to learn Viking Knit by watching videos. Alas, I was busier than I thought and failed to even search out videos to watch. Sigh. Despite being too busy to watch a few videos, I was able to get this necklace made. I'm kind in love with it. The focal was one I made forever ago with some scrapbook paper, a book trimming, a rhinestone, and Ice Resin. 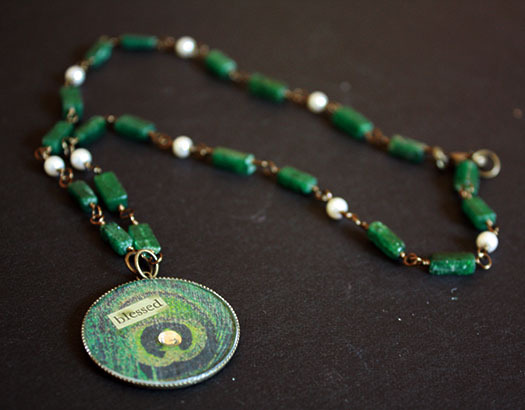 I pulled together the chain with square tubes of aventurine and glass pearls. These are wire wrapped onto Vintaj brass colored wire. Like most everything this month, I finished this card late. It was super simple. Gold paint was added to the playing card before a white chevron stencil. 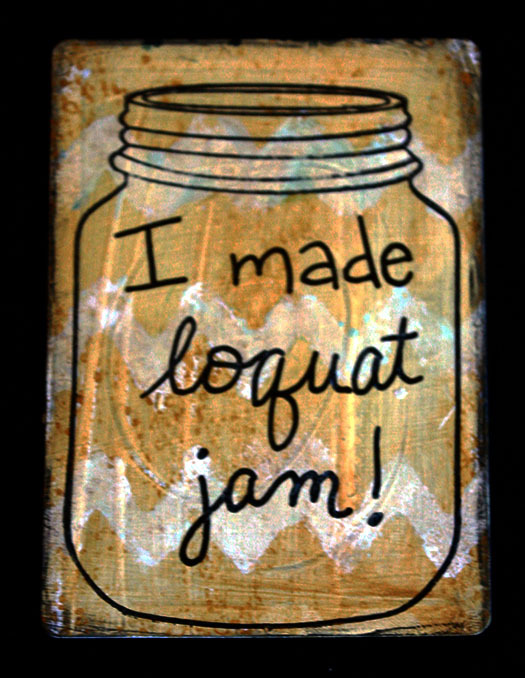 I used a new(er) jar stamp, and wrote in my exciting news of making my first ever jam with fruit from our yard. Exciting right!? Just one blog post was written during this week. 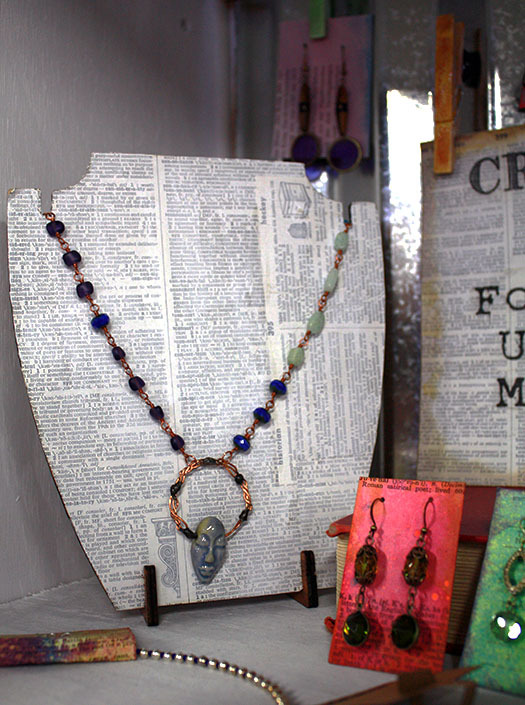 I shared what was new in the SAA booth and Etsy shop. You know what I'm going to say here, right? Yes, this page was made a little late. Spring didn't officially start until the next week, but my yard was already overflowing with blooms. As such, this page evolved. 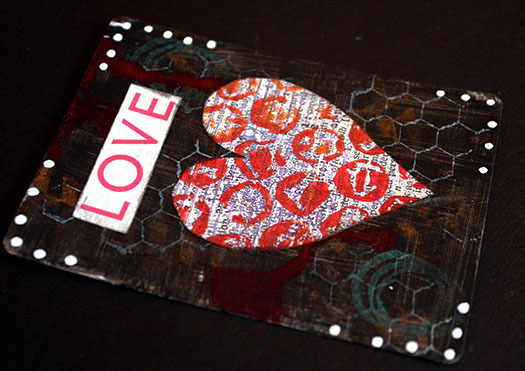 I scraped on some bright paints before collaging on die cut papers and other scraps that were on my desk. I added a stencil with ink and doodled with paint pens, pens, and pencils. While it's not the most beautiful thing, it let me be creative for a little bit. I'm happy with that. This week my main goal was to gather our taxes so they could be done. I did start on this goal, but didn't get it completely done. There is nothing to report. I didn't make a single thing. While I didn't make a card during this insane week, I was able to get one made earlier THIS week to make up for it. I wanted to play, but also use items within reach. As such, this card's background is just some splatterings of watercolor. 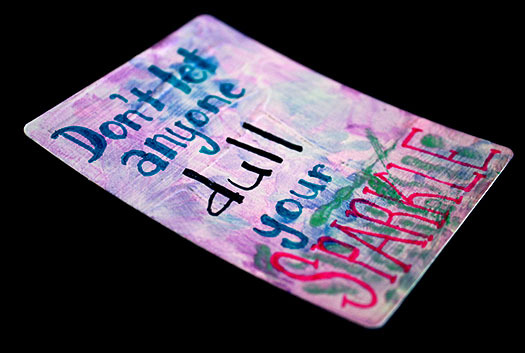 From there, I wrote out the phrase with some pens and added PearlEx powder around the word Sparkle. There's not much too it, but at least it's done. Somehow in the chaos that was that week, I was able to get a blog post up. Oh, wonder of wonders. I believe I worked on it from my mom's house. I had actually remembered to upload some videos so I could FINALLY share the altered playing cards I made for a swap in Novemeber. Alas, there was no journal page for this week. I'm STILL working on it. So that's how March went for me. My goal for this week has been to try to catch up on some of these undone tasks. However, that's not working out so great for me. Oh well, we'll get to that when April's over.